You may be aware that Apple’s Mail program has the ability to color incoming messages, using the Rules section of its Preferences—check out the News from Apple rule at Mail -> Preferences -> Rules for an example of how this works. But did you know you can apply your own color scheme to already-arrived messages (as well as sent messages), directly in the Mail viewer window? It’s amazingly easy to do, and (as of 10.4 ) works quite well—in 10.3, colorized messages would lose their color when moved to another folder. Today’s tip is best used for “ad hoc” coloring—when you want to apply a color to a message on a one-time basis. If you have regular correspondence that you’d like to see in different colors, your better off using Mail’s Rules. That way, the coloring is automatic, and can be based on the conditions you establish. But if you don’t want or need a rule, here’s how to color messages on the fly. First, you’ll need to have the color picker (as seen at right) visible, so choose Show Colors from the Format menu. Now comes the hard part. Click on a message in Mail’s message list, then click a color on the color picker. OK, so I was lying about that being difficult. That’s it; as soon as you click a color, it will be applied to the selected message (or messages, if you select more than one). Note that you can’t control the text color of the message, so you’ll want to stick to lighter shades for your colors—otherwise, the text fields in the message list won’t be visible. Also, you can’t sort by the colors you’ve applied—so this is stricly a tip to help draw your eye to certain messages based on their color. If you’re going to do a fair bit of coloring, you may want to create some custom colors for use in Mail. 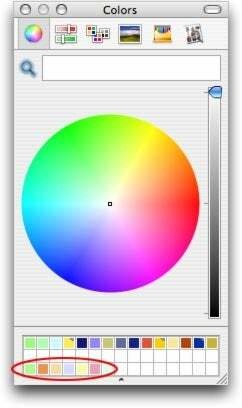 To do this, just drag a color from the wheel to one of the boxes at the bottom of the color picker. If you need more room for custom colors, you can show more boxes by dragging the dot at the bottom of the picker. You can use this technique to create a row of your own colors for use just with Mail, as circled in the image at right. If you want, you can do even fancier things to create your own color schemes—see “Take Command of Color” from the February 2006 issue of Macworld and this OS X Hints writeup for more on the secrets of the color picker.